Example #1 is the Palm Springs Wind Farm Tour. Were you unable to join us? Arrange your own through the "Best of the Best" tour company. 1. "Making Santa Monica College More Sustainable"
4. November 30: What is Sustainable Seafood? See details below. RENEW L.A. County invites you to a free screening of the documentary "Contested Streets": a film that shows the route to livable, gridlock-free streets. The screening will be preceded by a morning program sponsored by RENEW L.A. County, the Los Angeles County Department of Public Health's $16 million effort to address the obesity epidemic. The film will be followed by a panel discussion on the challenges we face in creating public space in L.A. County that is bicycle and people friendly. For more info and to RSVP, contact Rebecca McKenzie at rmckenzie@ph.lacounty.gov. Please indicate if you will be attending the morning session, the afternoon session, or both. 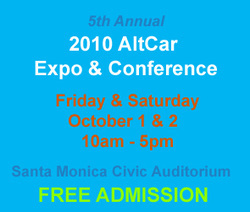 www.altcarexpo.com : pay particular attention to speakers schedule! Take notes and photos of yourself on site as well as what you see and find particularly interesting. If you're still unclear as to what my expectations are for extra credit, please ask me to clarify BEFORE you go! Look to local libraries and museums for relevant talks/exhibits as well. How do you like bottled water now??? Let's start a campaign to reduce their presence at Valley College!!! Looking for ways to "be green"? What does Matthew Simmons say about "Peak Oil"? How does M. King Hubbert explain "Peak Oil"?